The discovery of element 102 was a complicated process and was claimed by groups from Sweden, the United States, and the former Soviet Union. The first complete and incontrovertible report of its detection only came in 1966 from the Joint Institute of Nuclear Research at Dubna (then in the Soviet Union). The first announcement of the discovery of element 102 was announced by physicists at the Nobel Institute in Sweden in 1957. The team reported that they had bombarded a curium target with carbon-13 ions for twenty-five hours in half-hour intervals. Between bombardments, ion-exchange chemistry was performed on the target. Twelve out of the fifty bombardments contained samples emitting (8.5 ± 0.1) MeV alpha particles, which were in drops which eluted earlier than fermium (atomic number Z = 100) and californium (Z = 98). The half-life reported was 10 minutes and was assigned to either 251102 or 253102, although the possibility that the alpha particles observed were from a presumably short-lived mendelevium (Z = 101) isotope created from the electron capture of element 102 was not excluded. The team proposed the name nobelium (No) for the new element, which was immediately approved by IUPAC, a decision which the Dubna group later characterized in 1968 as being hasty. The following year, scientists at the Lawrence Berkeley National Laboratory repeated the experiment but were unable to find any 8.5 MeV events which were not background effects. In 1959, the Swedish team attempted to explain the Berkeley team's inability to detect element 102 in 1958, maintaining that they did discover it. However, later work has shown that no nobelium isotope lighter than 259No (no heavier isotopes could have been produced in the Swedish experiments) with a half-life over 3 minutes exist, and that the Swedish team's results are most likely from thorium-225, which has a half-life of 8 minutes and quickly undergoes triple alpha decay to polonium-213, which has a decay energy of 8.53612 MeV. This hypothesis is lent weight by the fact that thorium-225 can easily be produced in the reaction used and would not be separated out by the chemical methods used. Later work on nobelium also showed that the divalent state is more stable than the trivalent one and hence that the samples emitting the alpha particles could not have contained nobelium, as the divalent nobelium would not have eluted with the other trivalent actinides. Thus, the Swedish team later retracted their claim and associated the activity to background effects. The Berkeley team, consisting of Albert Ghiorso, Glenn T. Seaborg, John R. Walton and Torbjørn Sikkeland, then claimed the synthesis of element 102 in 1958. The team used the new heavy-ion linear accelerator (HILAC) to bombard a curium target (95% 244Cm and 5% 246Cm) with 13C and 12C ions. They were unable to confirm the 8.5 MeV activity claimed by the Swedes but were instead able to detect decays from fermium-250, supposedly the daughter of 254102 (produced from the curium-246), which had an apparent half-life of ~3 s. Later 1963 Dubna work confirmed that 254102 could be produced in this reaction, but that its half-life was actually 50 ± 10 s. In 1967, the Berkeley team attempted to defend their work, stating that the isotope found was indeed 250Fm but the isotope that the half-life measurements actually related to was californium-244, granddaughter of 252102, produced from the more abundant curium-244. Energy differences were then attributed to "resolution and drift problems", although these had not been previously reported and should also have influenced other results. 1977 experiments showed that 252102 indeed had a 2.3-second half-life. However, 1973 work also showed that the 250Fm recoil could have also easily been produced from the isomeric transition of 250mFm (half-life 1.8 s) which could also have been formed in the reaction at the energy used. Given this, it is probable that no nobelium was actually produced in this experiment. In 1959 the team continued their studies and claimed that they were able to produce an isotope that decayed predominantly by emission of an 8.3 MeV alpha particle, with a half-life of 3 s with an associated 30% spontaneous fission branch. The activity was initially assigned to 254No but later changed to 252No. However, they also noted that it was not certain that nobelium had been produced due to difficult conditions. The Berkeley team decided to adopt the proposed name of the Swedish team, "nobelium", for the element. One more very convincing experiment from Dubna came in 1966, again using the same two reactions, which concluded that 254102 indeed had a half-life much longer than the 3 seconds claimed by Berkeley. Later work in 1967 at Berkeley and 1971 at the Oak Ridge National Laboratory fully confirmed the discovery of element 102 and clarified earlier observations. In December 1966, the Berkeley group repeated the Dubna experiments and fully confirmed them, and used this data to finally assign correctly the isotopes they had previously synthesized but could not yet identify at the time, and thus claimed to have discovered nobelium in 1958 to 1961. In 1992, the IUPAC-IUPAP Transfermium Working Group (TWG) reassessed the claims of discovery and concluded that only the Dubna work from 1966 correctly detected and assigned decays to nuclei with atomic number 102 at the time. The Dubna team are therefore officially recognised as the discoverers of nobelium although it is possible that it was detected at Berkeley in 1959. This decision was criticized by Berkeley the following year, calling the reopening of the cases of elements 101 to 103 a "futile waste of time", while Dubna agreed with the IUPAC's decision. In 1994, as part of an attempted resolution to the element naming controversy, the IUPAC ratified names for elements 101–109. 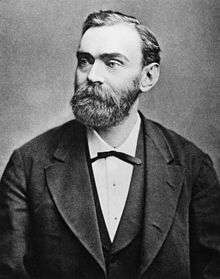 For element 102, it ratified the name nobelium (No) on the basis that it had become entrenched in the literature over the course of 30 years and that Alfred Nobel should be commemorated in this fashion. Because of outcry over the 1994 names, which mostly did not respect the choices of the discoverers, a comment period ensued, and in 1995 IUPAC named element 102 flerovium (Fl) as part of a new proposal, after either Georgy Flyorov or his eponymous Flerov Laboratory of Nuclear Reactions. This proposal was also not accepted, and in 1997 the name "nobelium" was restored. Today, the name "flerovium", with the same symbol, now refers to element 114. The lanthanides and actinides, in the metallic state, can exist as either divalent (such as europium and ytterbium) or trivalent (most other lanthanides) metals. The former have fn+1s2 configurations, whereas the latter have fnd1s2 configurations. In 1975, Johansson and Rosengren examined the measured and predicted values for the cohesive energies (enthalpies of crystallization) of the metallic lanthanides and actinides, both as divalent and trivalent metals. The conclusion was that the increased binding energy of the [Rn]5f136d17s2 configuration over the [Rn]5f147s2 configuration for nobelium was not enough to compensate for the energy needed to promote one 5f electron to 6d, as is true also for the very late actinides: thus einsteinium, fermium, mendelevium, and nobelium were expected to be divalent metals, although for nobelium this prediction has not yet been confirmed. The increasing predominance of the divalent state well before the actinide series concludes is attributed to the relativistic stabilization of the 5f electrons, which increases with increasing atomic number: an effect of this is that nobelium is predominantly divalent instead of trivalent, unlike all the other lanthanides and actinides. In 1986, nobelium metal was estimated to have an enthalpy of sublimation between 126 kJ·mol−1, a value close to the values for einsteinium, fermium, and mendelevium and supporting the theory that nobelium would form a divalent metal. Like the other divalent late actinides (except the once again trivalent lawrencium), metallic nobelium should assume a face-centered cubic crystal structure. Divalent nobelium metal should have a metallic radius of around 197 pm. Nobelium's melting point has been predicted to be 827 °C, the same value as that estimated for the neighboring element mendelevium. Its density is predicted to be around 9.9 ± 0.4 g·cm−3. The standard reduction potential of the E°(No3+→No2+) couple was estimated in 1967 to be between +1.4 and +1.5 V. The positive value shows that No2+ is more stable than No3+ and that No3+ is a good oxidizing agent. While the quoted values for the E°(No2+→No0) and E°(No3+→No0) vary among sources, the accepted standard estimates are −2.61 and −1.26 V. It has been predicted that the value for the E°(No4+→No3+) couple would be +6.5 V. The Gibbs energies of formation for No3+ and No2+ are estimated to be −342 and −480 kJ·mol−1, respectively. A nobelium atom has 102 electrons, of which three can act as valence electrons. They are expected to be arranged in the configuration [Rn]5f147s2 (ground state term symbol 1S0), although experimental verification of this electron configuration had not yet been made as of 2006. In forming compounds, all the three valence electrons may be lost, leaving behind a [Rn]5f13 core: this conforms to the trend set by the other actinides with their [Rn]5fn electron configurations in the tripositive state. Nevertheless, it is more likely that only two valence electrons may be lost, leaving behind a stable [Rn]5f14 core with a filled 5f14 shell. The first ionization potential of nobelium was measured to be at most (6.65 ± 0.07) eV in 1974, based on the assumption that the 7s electrons would ionize before the 5f ones; this value has since not yet been refined further due to nobelium's scarcity and high radioactivity. The ionic radius of hexacoordinate and octacoordinate No3+ had been preliminarily estimated in 1978 to be around 90 and 102 pm respectively; the ionic radius of No2+ has been experimentally found to be 100 pm to two significant figures. The enthalpy of hydration of No2+ has been calculated as 1486 kJ·mol−1. Twelve isotopes of nobelium are known, with mass numbers 250–260 and 262; all are radioactive. Additionally, nuclear isomers are known for mass numbers 251, 253, and 254. Of these, the longest-lived isotope is 259No with a half-life of 58 minutes, and the longest-lived isomer is 251mNo with a half-life of 1.7 seconds. However, the still undiscovered isotope 261No is predicted to have a still longer half-life of 170 min. Additionally, the shorter-lived 255No (half-life 3.1 minutes) is more often used in chemical experimentation because it can be produced in larger quantities from irradiation of californium-249 with carbon-12 ions. After 259No and 255No, the next most stable nobelium isotopes are 253No (half-life 1.62 minutes), 254No (51 seconds), 257No (25 seconds), 256No (2.91 seconds), and 252No (2.57 seconds). All of the remaining nobelium isotopes have half-lives that are less than a second, and the shortest-lived known nobelium isotope (250No) has a half-life of only 0.25 milliseconds. The isotope 254No is especially interesting theoretically as it is in the middle of a series of prolate nuclei from 231Pa to 279Rg, and the formation of its nuclear isomers (of which two are known) is controlled by proton orbitals such as 2f5/2 which come just above the spherical proton shell. The half-lives of nobelium isotopes increase smoothly from 250No to 253No. However, a dip appears at 254No, and beyond this the half-lives of even-even nobelium isotopes drop sharply as spontaneous fission becomes the dominant decay mode. For example, the half-life of 256No is almost three seconds, but that of 258No is only 1.2 milliseconds. This shows that at nobelium, the mutual repulsion of protons poses a limit to the island of relative stability of long-lived nuclei in the actinide series. The even-odd nobelium isotopes mostly continue to have longer half-lives as their mass numbers increase, with a dip in the trend at 257No. 1 2 Lide, D. R., ed. (2003). CRC Handbook of Chemistry and Physics (84th ed.). Boca Raton (FL): CRC Press. ISBN 0-8493-0484-9. ↑ Fields, P. R.; Friedman, A. M.; Milsted, J.; Atterling, H.; et al. (1 September 1957). "Production of the New Element 102". Phys. Rev. 107 (5): 1460–1462. Bibcode:1957PhRv..107.1460F. doi:10.1103/PhysRev.107.1460. 1 2 3 4 5 6 John Emsley (2011). Nature's Building Blocks: An A-Z Guide to the Elements. Oxford University Press. pp. 368–9. ISBN 978-0-19-960563-7. 1 2 Ghiorso, A.; Seaborg, G.T. ; Organessian, Yu. Ts. ; Zvara, I.; Armbruster, P.; Hessberger, F.P. ; Hofmann, S.; Leino, M.; Munzenberg, G.; Reisdorf, W.; Schmidt, K.-H. (1993). "Responses on 'Discovery of the transfermium elements' by Lawrence Berkeley Laboratory, California; Joint Institute for Nuclear Research, Dubna; and Gesellschaft fur Schwerionenforschung, Darmstadt followed by reply to responses by the Transfermium Working Group". Pure and Applied Chemistry. 65 (8): 1815–1824. doi:10.1351/pac199365081815. 1 2 "Names and symbols of transfermium elements" (PDF). Pure & Applied Chemistry. 69 (12): 2471–2473. 1997. doi:10.1351/pac199769122471. ↑ Hoffmann, Darleane C.; Lee, Diana M.; Pershina, Valeria (2006). "Transactinides and the future elements". In Morss, L. R.; Edelstein, N. M.; Fuger, J. The Chemistry of the Actinide and Transactinide Elements (3rd ed.). Springer. p. 1660. ISBN 978-1-4020-3555-5. ↑ Hulet, E. K. (1980). "Chapter 12. Chemistry of the Heaviest Actinides: Fermium, Mendelevium, Nobelium, and Lawrencium". In Edelstein, Norman M. Lanthanide and Actinide Chemistry and Spectroscopy. doi:10.1021/bk-1980-0131.ch012. ISBN 978-0-8412-0568-0. ↑ Haynes, William M., ed. (2011). CRC Handbook of Chemistry and Physics (92nd ed.). CRC Press. pp. 4.121–4.123. ISBN 1-4398-5511-0. ↑ Greenwood, Norman N.; Earnshaw, Alan (1997). Chemistry of the Elements (2nd ed.). Butterworth-Heinemann. p. 1278. ISBN 0-08-037941-9. ↑ Martin, W. C.; Hagan, Lucy; Reader, Joseph; Sugar, Jack (1974). 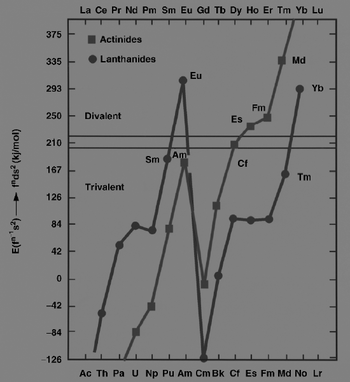 "Ground Levels and Ionization Potentials for Lanthanide and Actinide Atoms and Ions" (PDF). J. Phys. Chem. Ref. Data. 3 (3): 771–9. doi:10.1063/1.3253147. Retrieved 2013-10-19.